If you are the network administrator of a network . You would probably need a solution to block USB ports in your network of computers . It would help to save the internet bandwidth of the connected computers by disallowing users from copying downloads and also from the spreading of USB viruses like Autorun . 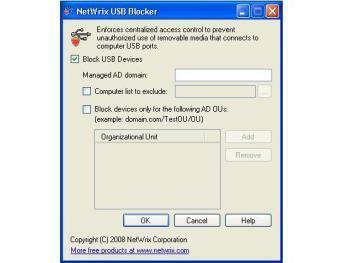 NetWrix USB blocker is the software that can block USB ports in computer network. It will also work in local computers , but the OS should support group policy . So NetWrix USB blocker cannot be used in other versions of Windows XP than XP professional .If you are on a local computer and if not connected to any network , you have enter domain name as workgroup to make the software work .NetWrix USB blocker has both freeware and shareware versions . Download NetWrix USB blocker to Block USB ports in a computer network .